Many Commodore 64 users switched to Amiga towards the end of the 1980s, which at the time was the most popular computer in Finland for gaming as well as for other computer-related activities. Amiga’s strength was the broad selection of games available, both commercial, as well as public domain and shareware games. Elfmania is an action-packed basic fighting game. 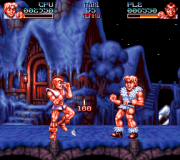 Terramarque only ever published one game, Elfmania, which offers the player a basic fighting experience coupled with an impressive appearance along with Aleksi Eeben’s excellent soundtrack. Unlike other fighting games of that era, the characters in this game only have one extra special move on top of the basic moves. You advance by winning against opponents, and by buying better characters with more powerful punches with the coins that you gain by winning fights. Multi-player games are settled by tick-tack-toe: The squares on the map can be taken over by winning a fight, and the first player to possess six squares is the final winner. The stench from rotting corpses fills the air when Mike Massacre gets to fulfill his sadistic tendencies of slaughtering the whole of mankind. 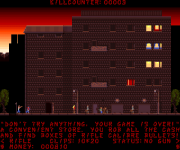 The player is sent to this blood-flavored task equipped only with a baseball bat, but soon enough you need firepower to butcher the growing group of opponents. If the player gets lucky, the final number of victims is tallied up in millions instead of tens or thousands. Damage: The Sadistic Butchering of Humanity can’t be taken too seriously. The streets of the future are full of violence. The absurd atmosphere of pop culture reigns in the gloomy future of 2010, and free artists are seen as rebels. In this action-packed adventure game the player plays a heavy metal band vocalist who has just survived a suspicious tour bus accident. The band members have all been attacked on numerous occasions, and the player has to survive the violence on the streets in order to figure out the real truth. Solomon's Key 2 is an excellent puzzle game. An island far up in the North, made entirely of ice, is at risk of melting because an evil wizard named Druidle is releasing flames all across the island. The queen of fairies chooses a young sorcerer called Dana to go and remove all the flames from the island. 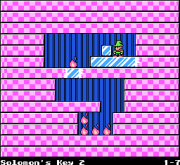 The player has a magic wand that he can use to create or destroy ice cubes. The flames can be extinguished by dropping or sliding ice cubes on top of them. The game was known as Fire ‘n Ice in the United States. This two-dimensional side scrolling game was originally published on Nintendo Entertainment System in 1993, and it was remade for Amiga in 2015 by a developer known by his pseudonym Hukka. The Amiga version includes a level editor and the ability to save the game. It lacks the possibility to fight with the final boss, some original animations and sound effects, plus some of the levels have been customized, but otherwise the game is playable from beginning to the end, just like the original version. This page was last modified on 27 January 2016, at 12:28.